Survey : Troops Top Choice Donald Trump - Stumpin' For Trump! 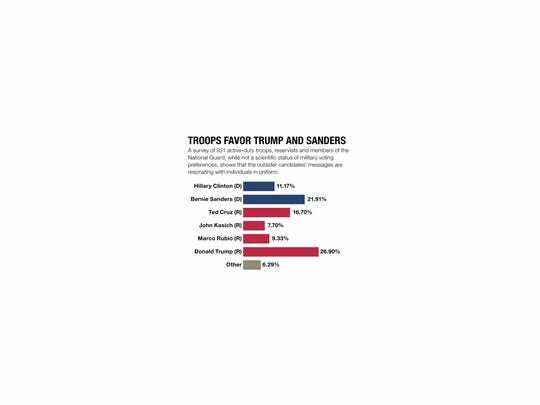 In an exclusive survey of American military personnel, Donald Trump and Bernie Sanders emerged as active-duty service members’ top choices to become the next commander in chief. The Republican front runner Trump was the most popular candidate in a subscriber poll that closed Sunday, with 27 percent saying they would back the business mogul if the election were held tomorrow. Sanders, the independent Vermont senator, was a close second at 22 percent. The results — based on responses from 931 active-duty troops, reservists and members of the National Guard — do not offer a scientific status of military voting preferences. However, they do show that the outsider candidates’ messages are resonating with individuals in uniform. The data also suggest that military personnel have not been dissuaded by political rivals who contend Trump and Sanders have weak foreign policy credentials and don’t have recognized experts as national security advisers. In the poll, nearly half of the service members surveyed said they were unhappy with the discussion of national security issues in the presidential race so far. Fewer than 5 percent were “very satisfied” with how the topic has been broached. Florida Republican Sen. Marco Rubio, who has made national security issues one of the centerpieces of his campaign, was nearly last in the Military Times survey, with only about 9 percent of candidates favoring him. Texas Sen. Ted Cruz had almost double that, with 17 percent support. Those surveyed offered only slightly more support for Republican Ohio Gov. John Kasich (8 percent) than potential third-party candidates (6 percent). Democratic front runner Hillary Clinton received a little more than 11 percent backing.